My last post was Snowdon from the back way, this day was about approaching it from the side. A little-used ascent route, not surprisingly because it was horrible (more later), then the great Crib Goch north and east ridges and the horseshoe route to Snowdon summit. I’ve done this walk before but not for some time. 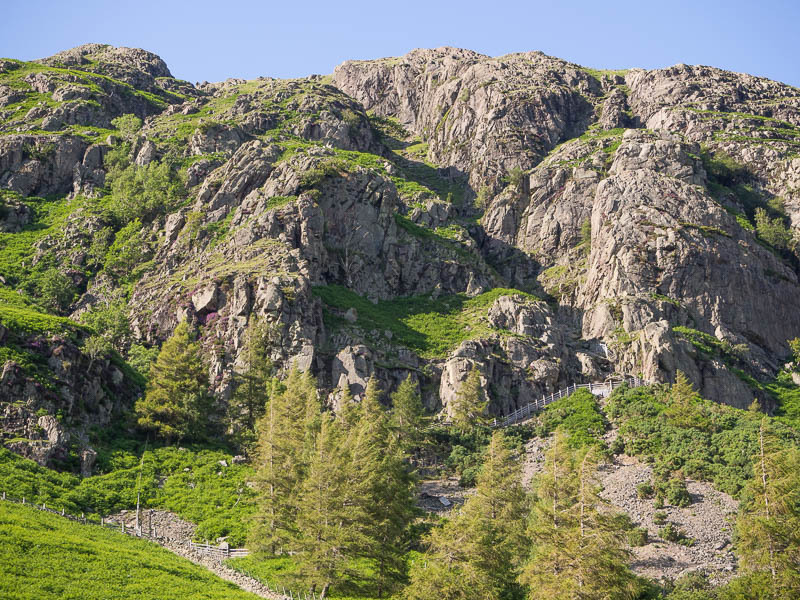 Starting in Langdale, it climbs up clockwise towards Crinkle Crags summit, traversing the several crinkles then coming back down via The Band. Flowers in the meadow by Stool End farm with the Pikes on the skyline. Bwlch Tryfan, Tryfan and eastwards. 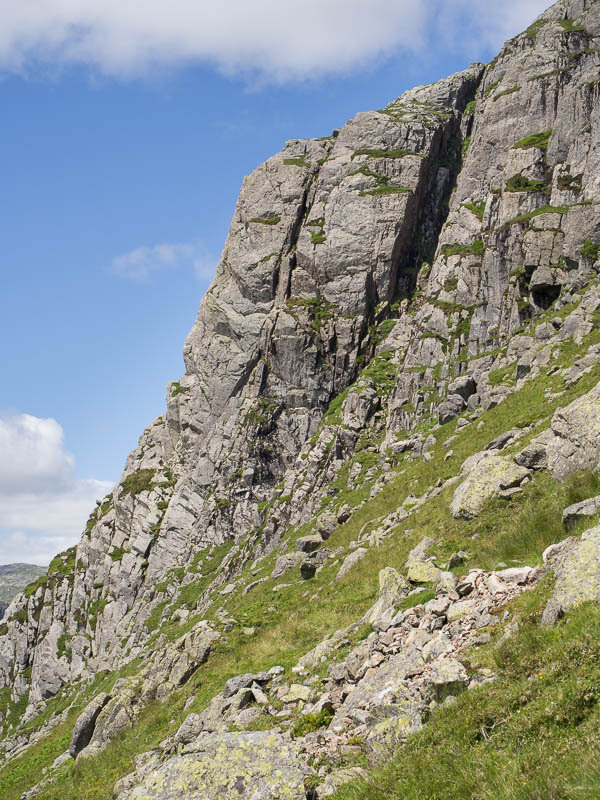 Bristly Ridge is one of the best known scrambles in Wales. It’s only grade one but has some great exposure and positions and is an adventure all the way. The scrambling starts at Bwlch Tryfan, the saddle between Tryfan and Glyder Fach, and it’s often done in conjunction with the Tryfan north and south ridge traverse. I’m not fit enough for that at the moment, perhaps later in the year. This was a perfect day for it, bright, not too windy, not too warm, and not too busy. Navigation to Bwlch Tryfan is fairly easy and the paths are good except for the steep, loose, slog from llyn Idwal to Llyn Bochlwyd. The mountain scenery around Ogwen and Idwal is, in my opinion, second to none. Sharp peaks, acres of rock, deep blue lakes, and a distant view to Anglesey. 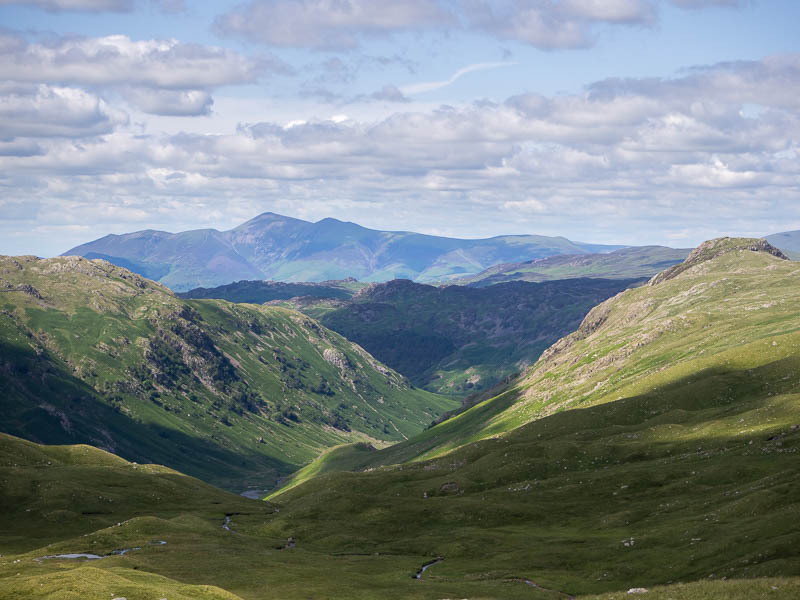 With very easy access from the car it has to be one of the best places in Britain for mountain adventures. As soon as you leave the shores of Idwal to climb above the climbing crag of the Gribin Facet you leave any crowds behind. The views of the lake and of Y Garn and then down the valley to Anglesey get better and better. Then you reach the quiet lake of Llyn Bochlwyd in its spectacular cwm with a great view of the west face of Tryfan. Upwards easily to Bwlch Tryfan between the rocky arms of Tryfan and Bristly Ridge and a welcome break with a sandwich and to watch the line that people were taking to start the scrambling. I hadn’t brought a guide book with me so I was relying on the route being very well marked by the passage of countless feet and hands. The trodden route seems to lead most naturally to a very obvious cleft in the rock, which seems to provide a good route up. Reading the guidebook when I returned, I’m not convinced it was the right way but it’s the way I took and it was, indeed, well worn and polished. The scrambling was good, up the narrow gully between steep rock walls. The moves were good and satisfying but not hard until a section is reached that is very loose underfoot. This led to an awkward chimney that gave a tricky couple of moves. Eventually you leave the gully to see great views of the Ogwen Valley. At this point I was definitely back on the proper line – there was nowhere else to go. The scrambling continues over towers and blocks with some tricky moves and exposed positions. It’s never that hard but sometimes it’s comforting to have someone to follow because it isn’t clear that the route you’re taking won’t lead you into trouble. At one point I had a nasty couple of moves downwards to get down off a block which I could have avoided on the right. On the upper section of the ridge, looking at the spectacular rocks of Glyder Fach’s east face. Finally I arrived on the wide summit plateau. Moonscape would be a good description. Huge shards of rock stick out at all angles, creating fantastic rock sculptures all over. The most famous of these is Castell y Gwynt, the Castle of the Winds. There’s plenty of easy scrambling still to be done if you want it, traversing over these jagged outcrops. 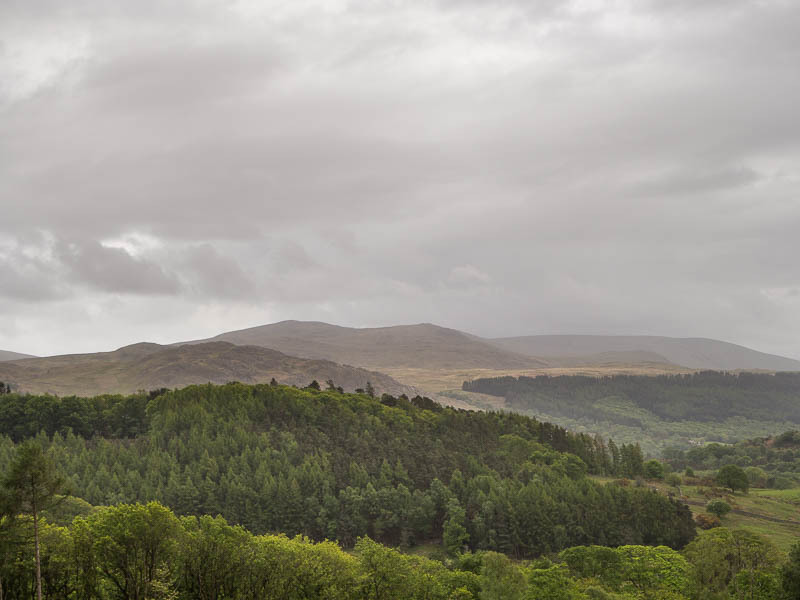 The views are panoramic and, light and haze permitting, you get a particularly good view of the Snowdon Horseshoe. The Snowdon Horseshoe from Glyder Fach summit. A good way down is to scramble down the Gribin Ridge back towards Llyn Bochlwyd but I’ve done this several times and it’s hard work. 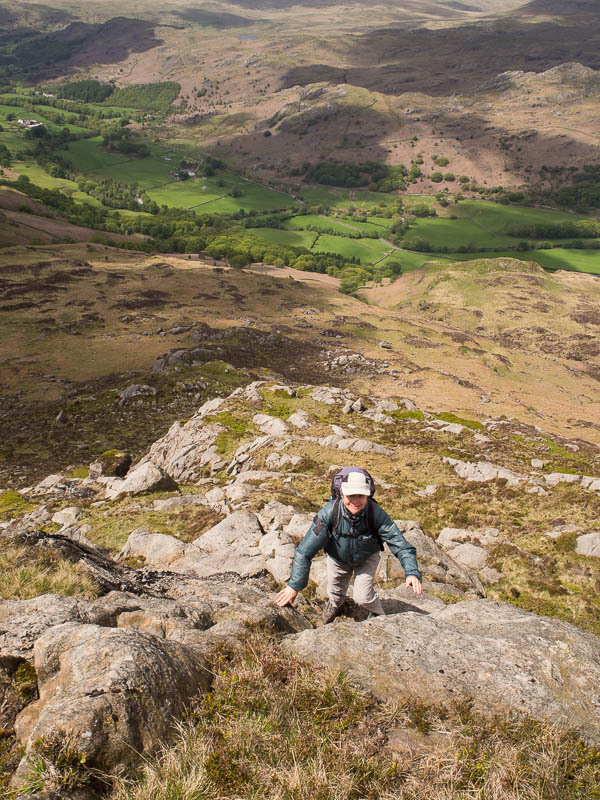 The easier way (longer but more straightforward walking) is to continue over Glyder Fawr summit and down to the Devil’s Kitchen. 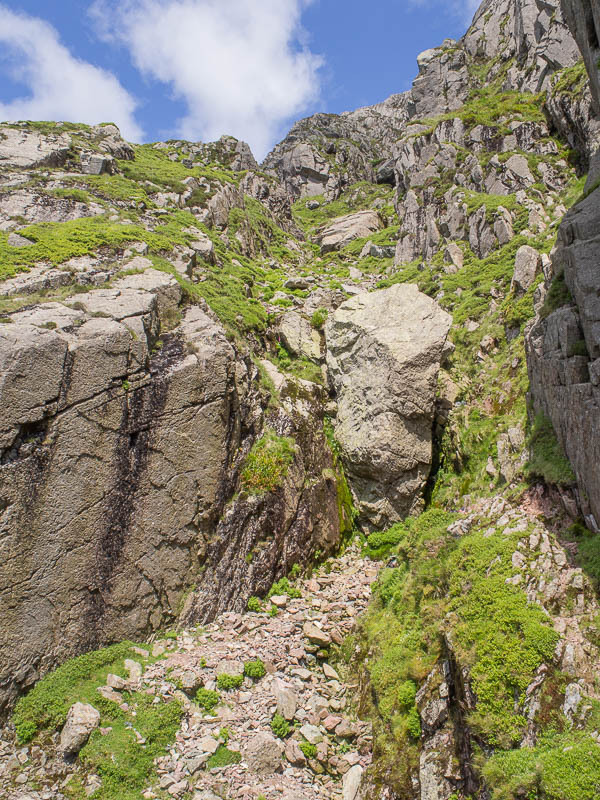 This was mostly fine but about half way down from Glyder Fawr summit the path seems to drop away vertically. When you look over the edge you see that it’s still there but much steeper on an almost-bare scree slope. I was on my backside several times during this most unpleasant loose section so I had a nice sandwich break at the tiny tarn in the cwm between Glyder Fawr and Y Garn, before the descent into Devil’s Kitchen. This next section is very steep but the path has been laid with blocks so it’s good going. The rock scenery is fantastic. You have the choice either left or right around Llyn Idwal. I chose right, so I could look at the climbers and go and lay hands on the perfect rock of the Idwal Slabs. Not far now back to the car. April 2013 and I was on my own while Joy went to China for two weeks. Time for mountain adventures. 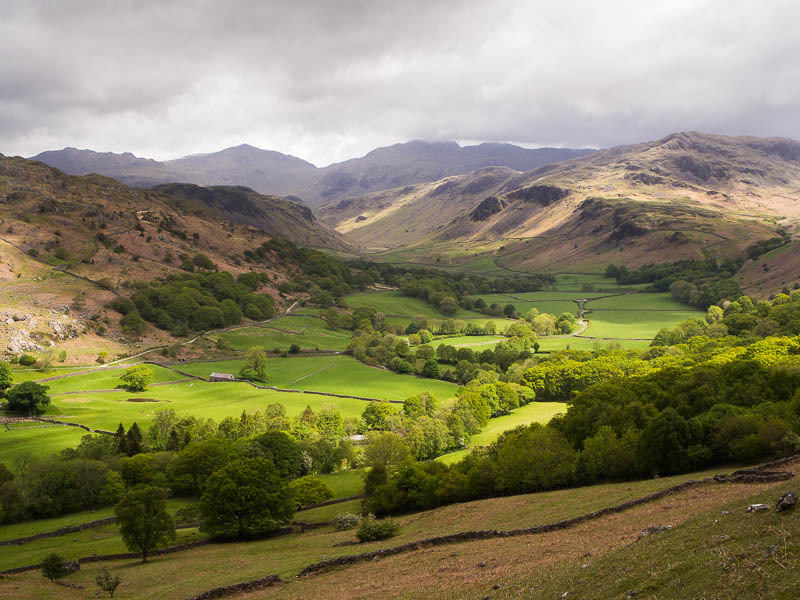 The chosen location was Eskdale, the Woolpack Inn specifically. The planned outing was to walk along Eskdale to the east side of the Scafell range and ascend the three star grade 3 scramble of Pen by Thor’s Buttress, then see what happens after that. The scenery is magnificent right from the start but the weather wasn’t so magnificent. Despite being well into spring it started out cold, windy and with heavy snow and hail showers but the forecast was supposed to be good so I persevered. At the junction of the Esk with Lingcove Beck there are several ways to go. 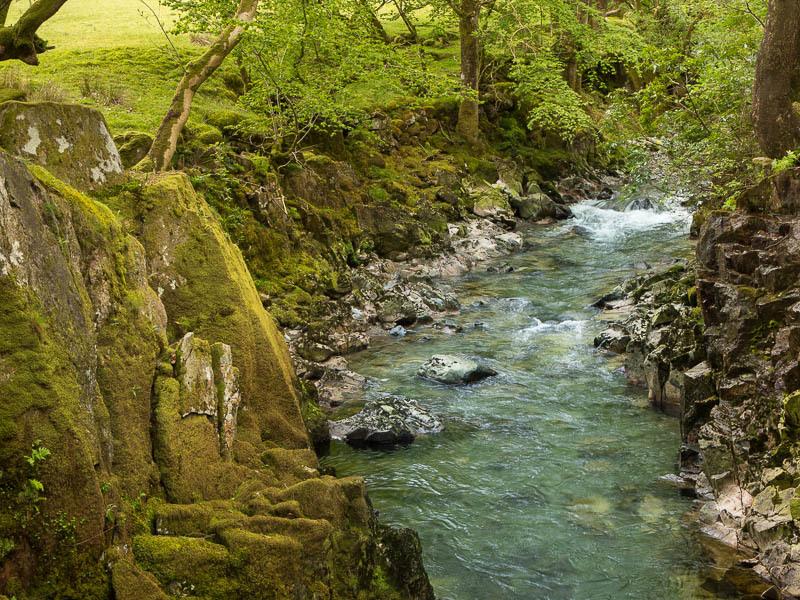 I chose to start the scrambling on the fairly vegetated rocks between the two water courses, marked as either Throstle Garth or Scar Lathing on the map. Whatever the hill is called it was good to get my scrambling muscles warmed up. Then over the aptly named Great Moss. 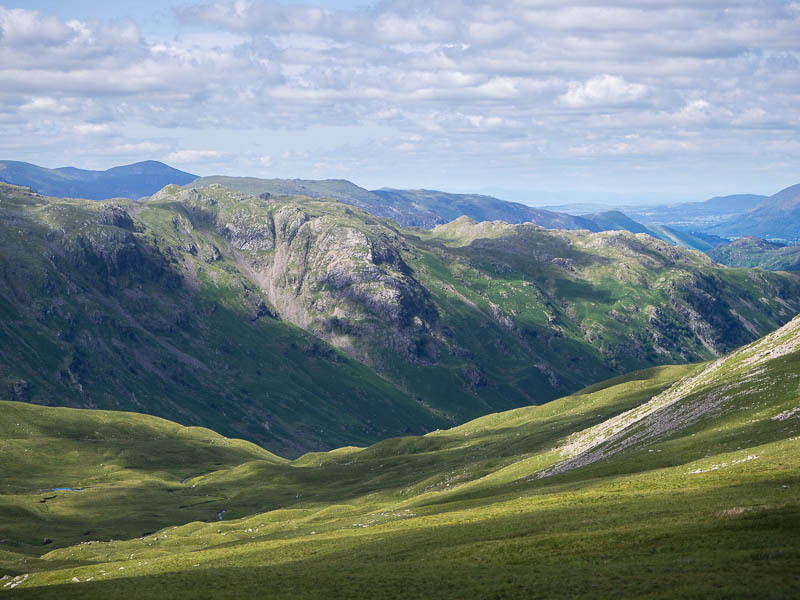 You’re now in amongst the best and most spectacular scenery in the whole the Lake District, with Scafell, Scafell Pike, Ill Crag, Great End, Bowfell, and Crinkle Crags visible and a really wild and remote feel. The route I was following didn’t have another soul on it, though that would change later on when I reached the summit of England’s highest mountain. The start of the proper scrambling is on the right hand end of the classic climbing crag of Esk Buttress and aims for the very attractive pointed summit of Pen, which isn’t even named on the OS map. The route is easy to find to start with but finding the best line wasn’t always obvious. At one point I needed a very delicate traverse to get back onto easier ground. The scrambling was good and the rock was nice. Esk Buttress right hand end, Thor’s cave is the black gash at the right. After the first section it eased into rocky walking to reach the base of the summit rocks. From below this looks like just a few metres worth but turns out to be another fifty metres of very nice scrambling, easier than the first section. The summit isn’t really an independent top, just a protrusion on the side of the east flank of Scafell Pike, but it’s a wonderful viewpoint and I was totally alone among very grand and wild rock scenery. The onwards route to the summit of the Pike was most attractive, steep rocky walking for the most part. I started to find dustings of snow and build-ups of hoar frost sculpted by the wind. The weather had improved by now and it was largely bright and sunny, though still very cold. Reaching the summit I also reached the crowds. At least fifty people there. 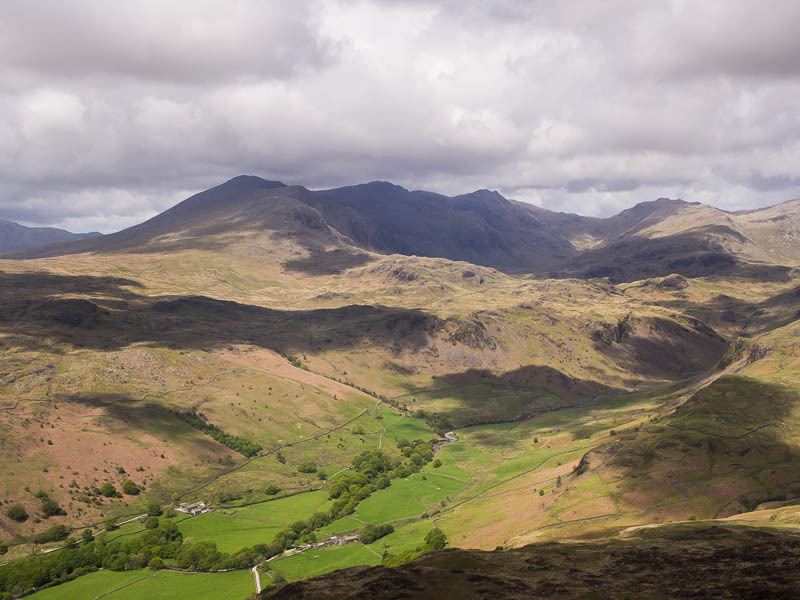 As Scafell Pike summit is very wide, it accomodates them well and you don’t feel overly crowded. The view is quite spectacular. 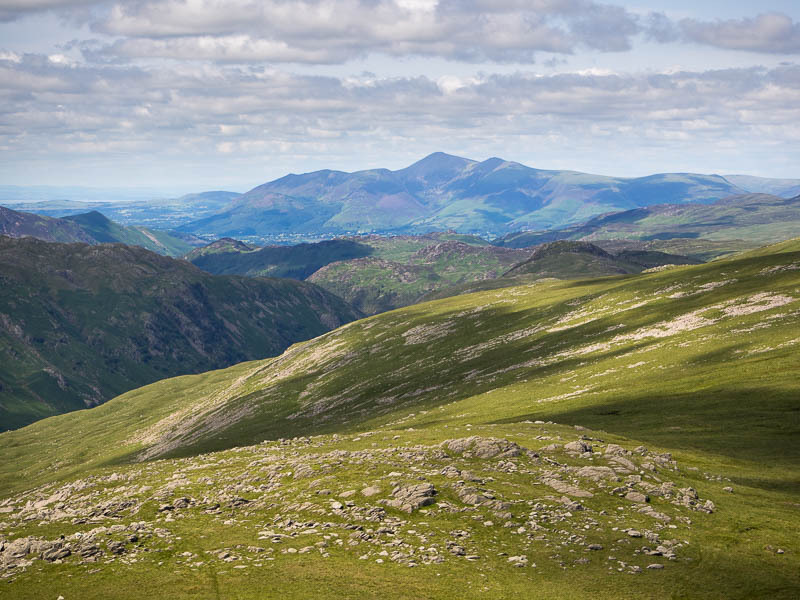 You see the sea both to the south and to the north-west, and all round to Skiddaw and Derwentwater, Ennerdale, down Eskdale, over to Langdale, Wetherlam, Coniston, and many others. 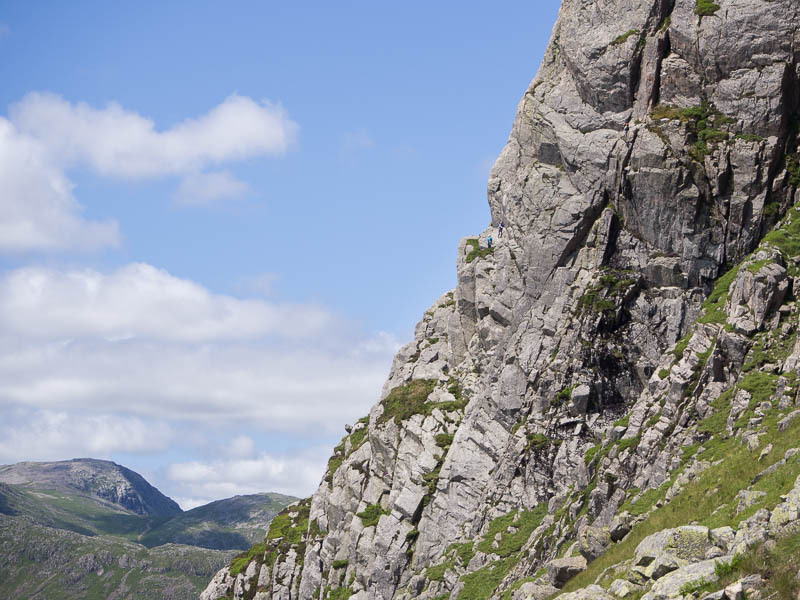 The return was down to Mickledore to start, with an incredible close-up view of Scafell crag, one of the Lake District’s most classic climbing crags. There had been significant snowfalls in the winter of 2012/2013 and even at the end of April Lord’s Rake was still fully banked out with hard snow. While there (this was my first time on the Scafell range) I checked out Broad Stand, the infamous step that can take the adventurous from Mickledore to Scafell. Looks very good but definitely for another time as it was both wet and icy. So, the descent was to be down the beck towards the falls of Cam Spout and back to Great Moss. Cam Spout is a wonderful set of falls down a rocky staircase, with some simple scrambling to one side and great views out over Eskdale. The return was largely back the same way but this time much warmer and sunnier and I could linger a little, looking at the turquoise rock pools of the River Esk. Here’s a gallery of all the best shots of the day. All taken with the Pentax K20D – this was before I’d bought my Olympus. Napes crag, Tophet Wall, Westmorland crags. Napes Needle is visible. Upper Mosedale, Pillar at its right hand head, the Mosedale horseshoe route is clear. 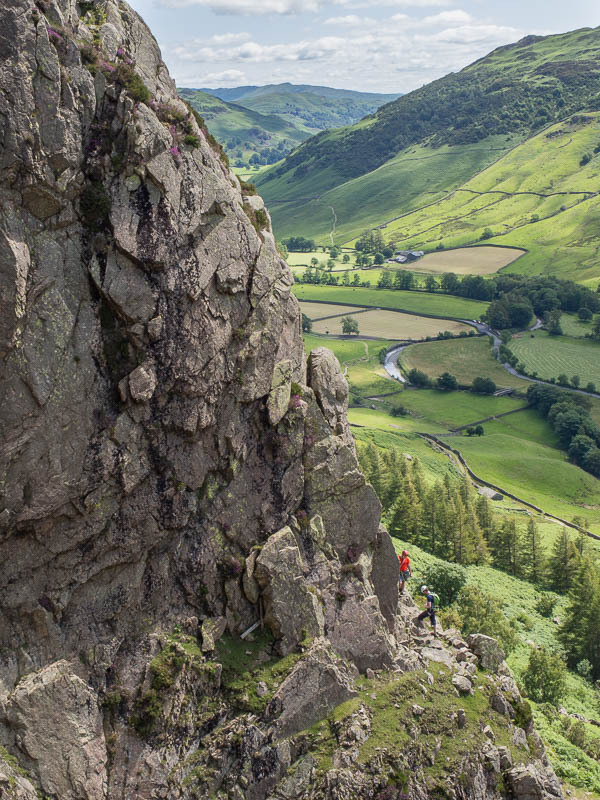 A day for exploration among the crags of Langdale. With a suspect ankle I didn’t want to commit to a big distance so I thought I’d just amble and wander around the crags, trying to find alternative ways up the hillside and get a good view of the crags at the same time. I particularly wanted a good look at Gimmer, which I’ve never been close to before. Starting from the Old Dungeon Ghyll hotel I went up towards the classic climbing route of Middlefell Buttress, surprised to see only one team of climbers on it. The weather was perfect and I thought there would be crowds. I sat round and watched for a while, though climbing is a terrible spectator sport. 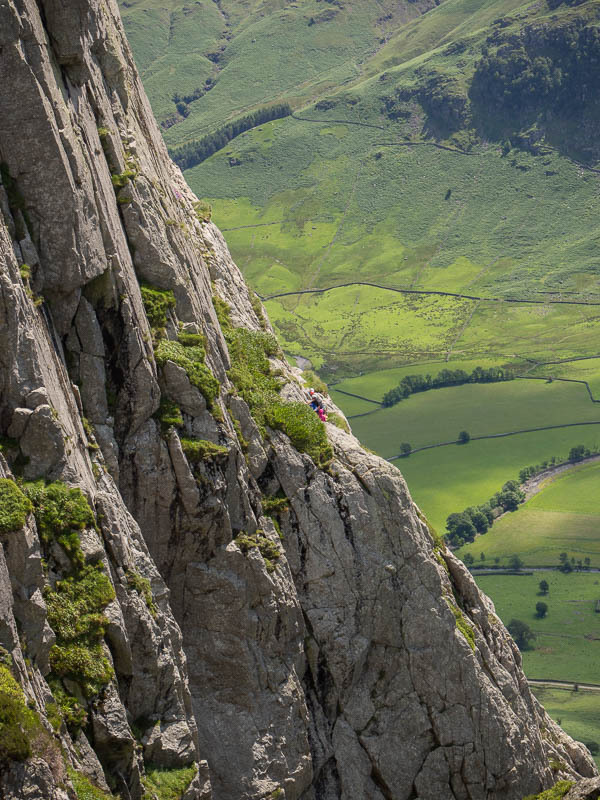 Climbers at the top of the first pitch of the classic route of Middlefell Buttress, with Langdale behind. The gully and crags to the left were attractive, though bracken becomes a problem this late in the summer. The map shows a path (presumably a climbers’ path) going up here and towards Gimmer so I wandered upwards. I tried scrambling for about ten metres on a short buttress that started as good rock but then turned into a 45 degree slope of chest high bracken, which wasn’t so much fun but that only lasted another ten metres before I could see a very faint steep winding path. I stopped to watch the climbers again, who had made a little progress. Carrying on up the now-disappeared path, just to the left of the gully that bounds Middlefell Buttress, I wasn’t sure where it would end up but it seemed a good line. It was just steep walking but with great views of the crags to my right. Eventually it joined the main Mark Gate path and I went left towards the base of Thorn Crag. There’s plenty of scope for other scrambling lines round here, the route I took was mostly steep and rough walking but it was nice to go a little off-piste. I traversed over towards the now-prominent Gimmer Crag, leaving the path to stay at the same height. I could now see the climbers’ path just below me so I joined that and carried on. I sat for refreshments on a comfy rock with a great view of the south-east face of Gimmer. I could see several climbing parties looking tiny on the huge crag. This rock is covered in famous routes and it was good to get a close look. I’m hoping I’ll get the chance to climb here one day. Gimmer Crag. South East gully is the huge black gash. Climbers can be seen in various places but you’ll need to look closely. 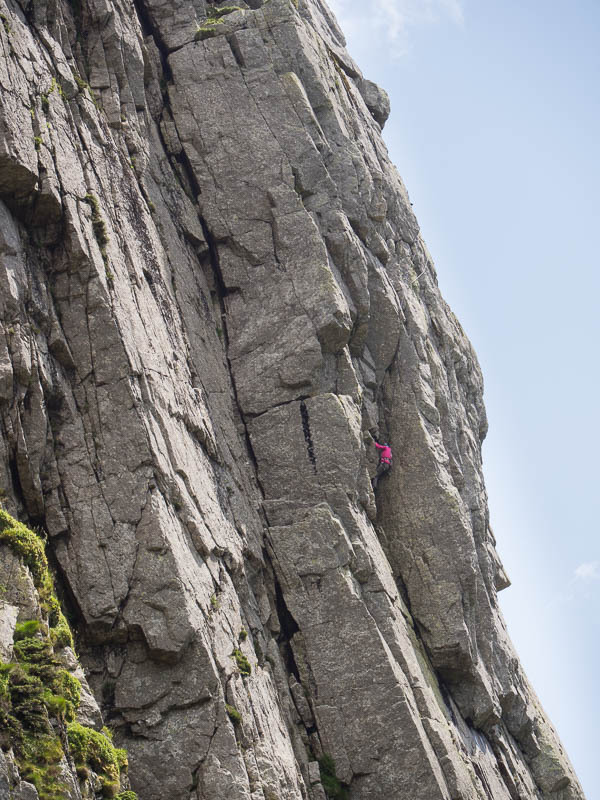 Another view of climbers on the south east face of Gimmer. I wanted to see the other side so I dropped down a little towards the bottom of the nose of the crag until I could walk over a grassy way which then dropped me into the gully that bounds the left side of the crag. I could now see plenty of climbers. I still didn’t have a plan but thought I’d go up to where they’d started from to get a better look. The gully was very tempting and looked like it would lead higher. I could always turn back if there was a blockage. It turned out to be fairly easy walking and scrambling with some rocky steps and among great rock scenery. I kept stopping to look at the climbers and eye up the various routes, trying to memorise the crag layout for the future. The gully on the west side of Gimmer. My ascent went to the right of the very large block in the centre of the picture and then straight up the gully. At a fork in the gully the right hand fork looked like it led into steep terrain but the left fork looked good so I took that. There was one awkward step but otherwise it was straightforward and eventually topped out on the path between Loft Crag and Pike of Stickle summits. I went right to sit on the top of Loft Crag for sandwiches and look at the tremendous view down onto the rocks of Gimmer, over to Harrison Stickle, Crinkle Crags, Bowfell, etc. Looking east from Loft Crag summit. Pike of Stickle summit from Loft Crag. Tiny people can be seen on top. 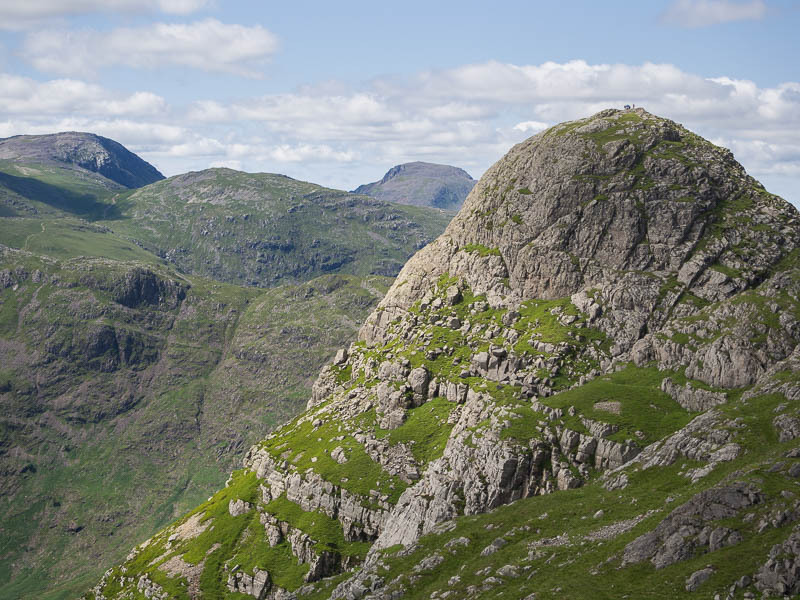 Loft Crag and Gimmer from Pike of Stickle. 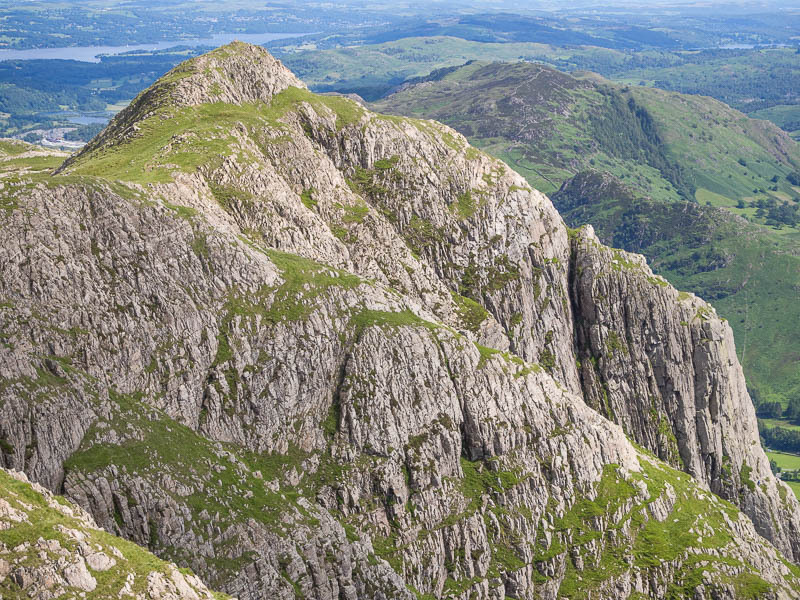 Now up to the very tempting Pike of Stickle summit, taking in some easy scrambling on the way up. From here I thought I’d return via Jack’s Rake but the light was better to the north and I wanted to take some photos looking down Langstrath. 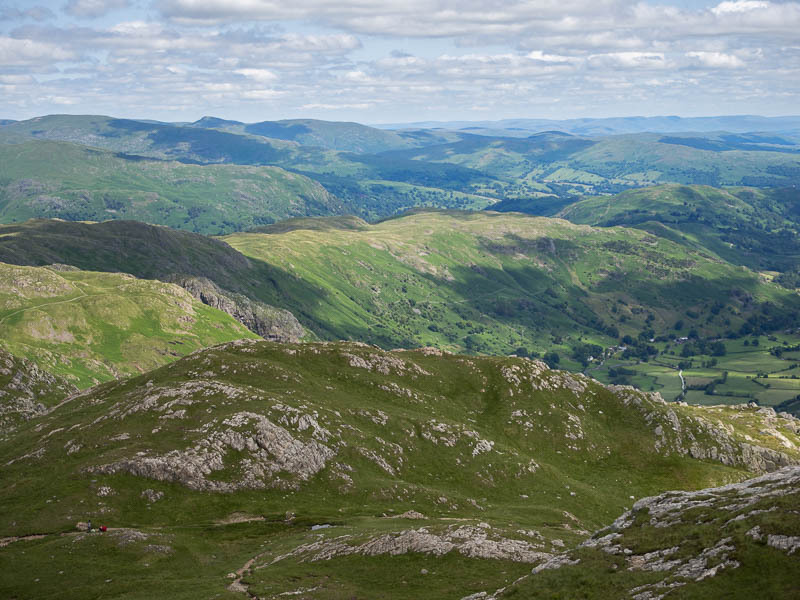 I could see in particular the clear line of Cam Crag Ridge, a classic scramble up to Glaramara. 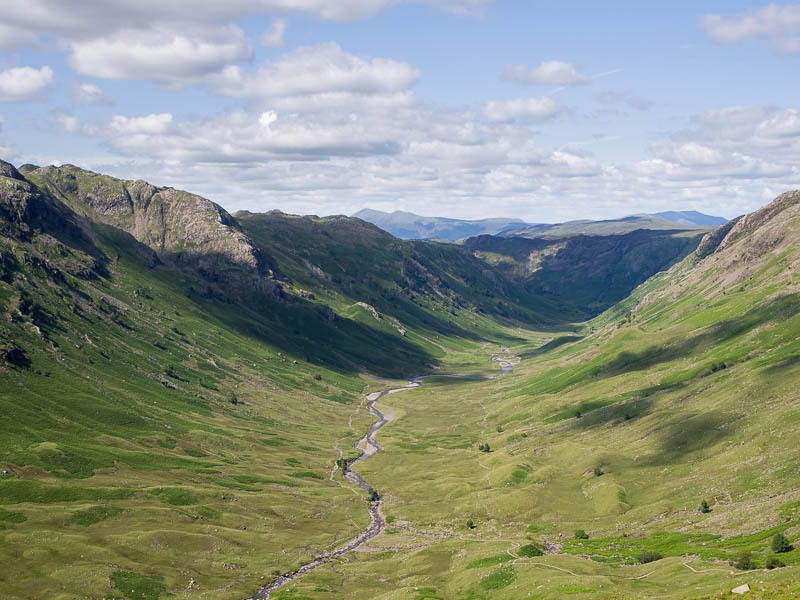 I wandered over northwards to Stake Pass to look down Langstrath, taking lots of pictures, then descending down the Cumbria Way and the long easy return along Mickleden. Great Gable in the distance. From the return path I could clearly see the ascent routes. The fork in the gully I mentioned earlier could be clearly seen. The right fork did indeed look difficult but I’d love to go there again, it looks like you could take it then escape leftwards up steep scrambling rocks. Gimmer. My ascent was immediately to it’s left. My route ended up at the notch on the skyline at the left side of the picture. You can see that the right-hand fork (mentioned above) leads to much steep ground. The line of ascent at the start of the day. Middlefell Buttress is on the right, my ascent started just to its left in the shadowy gully but took a faint steep path to get above the crags in the picture centre (in shade) and then steep walking through the bracken above. Much nicer weather than yesterday encouraged us to go higher. 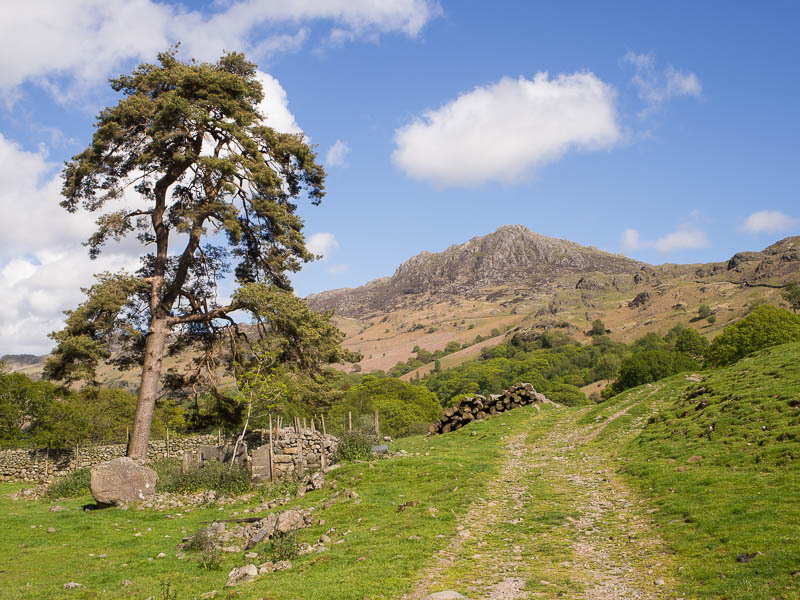 Harter Fell can be seen from all round the valley as a perfect pyramid and has very inviting rocky flanks (especially on the west and north). We once did a climb on the north side ( Demming Slab ) that turned out to be a very vegetated adventure but with a good mountain atmosphere for a relatively small peak. We started (with our friends Richard and Polly and their dog Morgan) along the beautiful turquoise river Esk from Boot and along to the Doctor Bridge. I’ve no idea why it’s called the Doctor Bridge. Past Penny Hill farm and you strike up the hillside and the terrain becomes really nice. 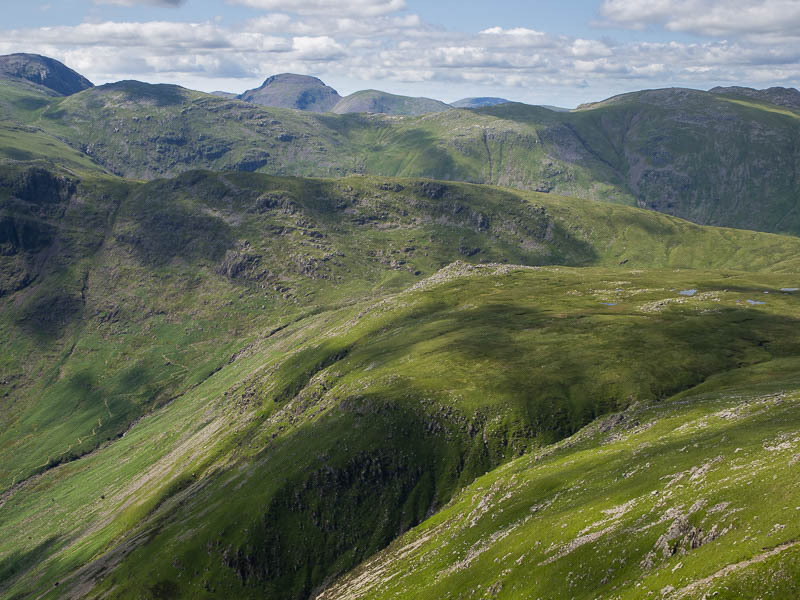 Incredible views east and west along the valley and north to the cirque of the scafells, bowfell and crinkle crags. 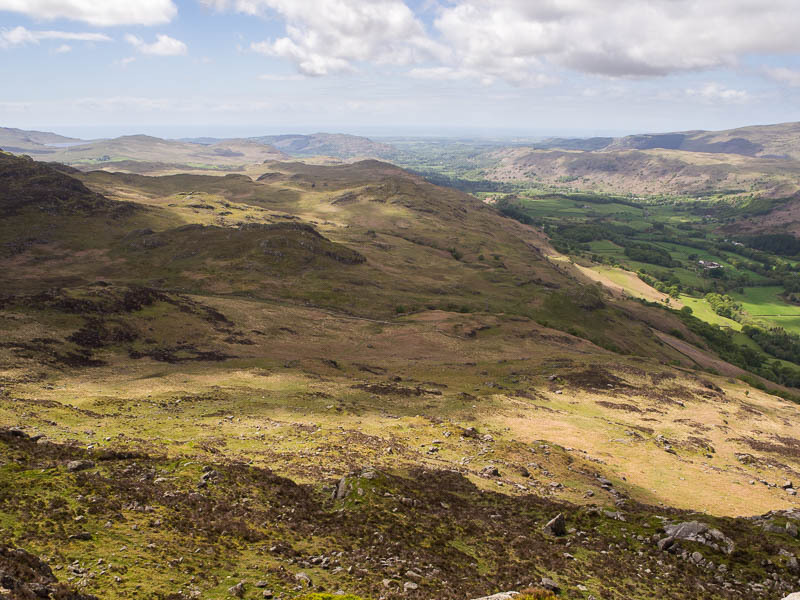 Lovely rocky knolls surrounding you, you cross a tumbling stream and eventually the path gives out and you have to follow compass and terrain clues until you find the crossing of Spothow Gill and find the clearer path that ascends Harter Fell west flank. Upper Eskdale towards Bowfell (pyramidal peak left of centre) and Crinkle Crags (in the clouds, centre). Now you can see the rocky west flank of the hill and out with the scrambling book, Steve Ashton’s “Scrambles in the Lake District”. We were looking for routes 100 and 101. His pictures and descriptions usually, shall we say, allow for a spirit of adventure. I was pretty sure I was looking in the right place but couldn’t see any evidence of the so-called Harter Beanie, the “prominent hat-shaped knob”, on route 101 but route 100, the north-west crags route, did seem to be there and it looked very inviting. Harter Fell north and west faces seen from Penny Hill farm. The scramble route is the lighter-coloured ridge in the centre of the face running slightly bottom left to top right. The start was steep grass but it led into a very nice looking rock gully with steep but beautiful rocky walls on either side. Move leftwards up great rock onto what looks like a steep exposed ridge, though when you get there it turns out not to be at all exposed but now you can see a continuous line of good clean rock stretching away above you. Joy looking up the route from a short way up. Perfect rock. Looking down on the route from much higher up, on a more grassy section between the two main rock sections. You can pretty much put the book away now and choose any line you fancy. There is a more continuous ribbon that invited us up. The moves were never hard, with just two or three needing thought and meriting grade 2. We had the rope handy but never felt the need of it. There is a break after this stretch then another crag above. Out with the book to find the best route, which isn’t obvious but the description is accurate and the photo in the book useful. 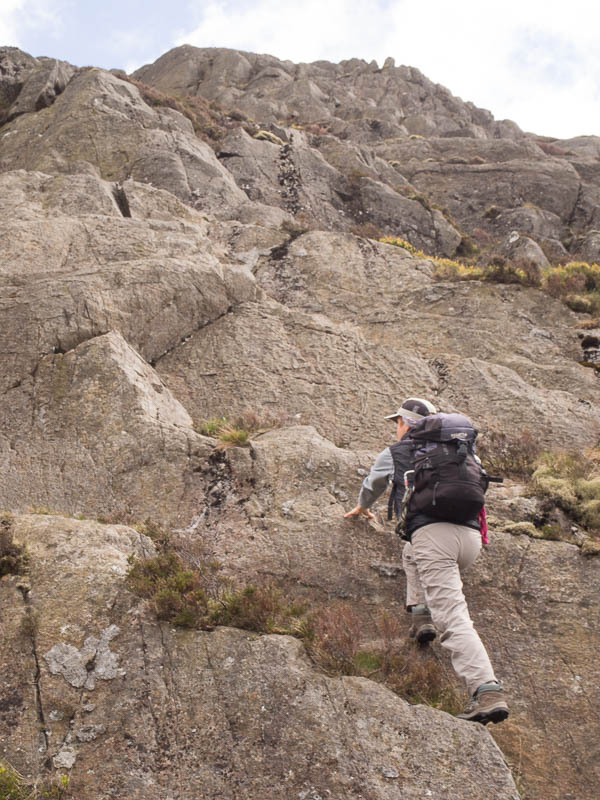 This is another good section of continuous rock until the ridge flattens and you’re on much easier ground with the top of Harter Fell ahead of you. There are still some very nice easy rocks to play on as you make your way to the summit. 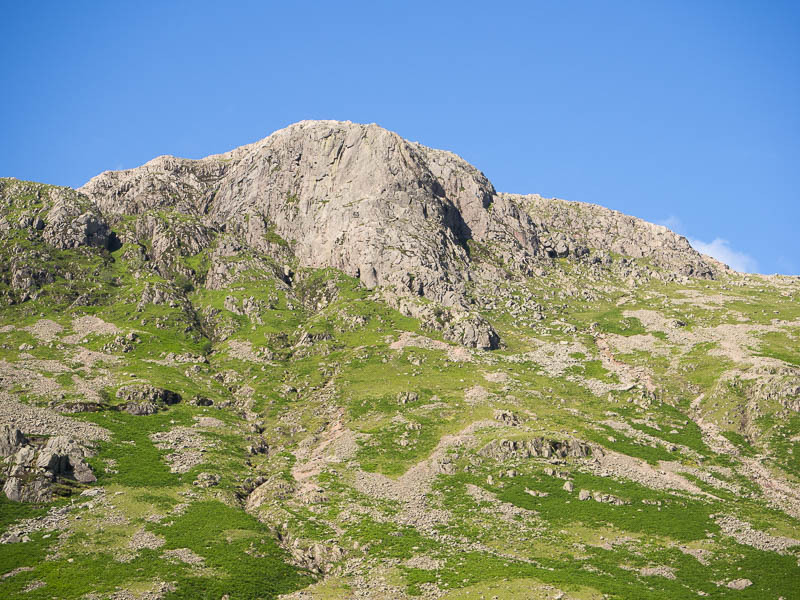 Harter Fell is one of my favourite summits and I’ve often thought I should take rock shoes and a bouldering mat to play at the top but never have. Views all the way were incredible. We could see the Isle of Man to the west, Morecambe Bay south-west, Pillar, Scafells, Bowfell, Crinkle Crags, Hardknott Pass. The weather had turned clear and sunny. Looking west towards the coast. The Isle of Man is out there somewhere. Looking west, down to Boot. Return back the way we came, still needing navigation following compass and terrain features until back at Penny Hill farm, then along the road to Boot. Although in the heart of the mountains we decided on this lower walk after seeing the forecast of fifty mile per hour winds on the tops. From near the bottom (south-western) end of mitredale near the end of the walk. 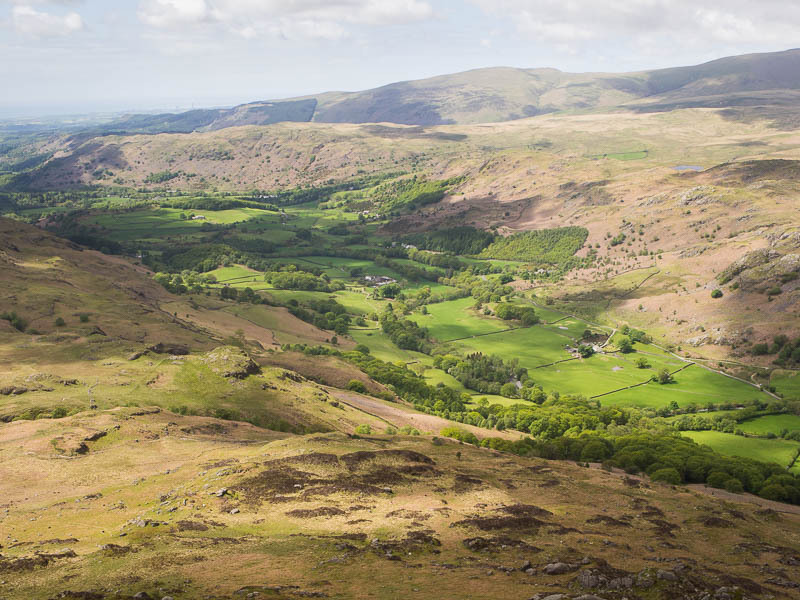 We started from our B+B and wandered round the various paths back to Eskdale Green then started to figure out a way around Fell End and along the shallow ridge to Boat How. The terrain is full of rocky knolls and succulent bogs and there are no clear paths. Navigation along here needs to be aware but not precise as you can wander around where you like as long as you go vaguely in the right direction. The two tiny tarns of Siney Tarn and Blind Tarn help as way-markers. Following the compass and the terrain we eventually found the stone circles on Brats Moss then carried on, again using compass and terrain as a guide, until we could see Burnmoor Tarn. The big hills were hiding in the clouds, brooding on our right. We carried on hoping for views down into Wasdale but we kept hitting false horizons and gave up, wanting some lunch. We chose a spot by an ugly ruined house on the south end of the tarn, hiding from the wind. The next stretch was a surprise. The head of Miterdale is a box-shaped ring of small crags and waterfalls that narrows into a fairly shallow valley with a small stream in the bottom that eventually becomes the river Mite. You can walk right next to the water course until the valley widens out and you get to the farm. The whole valley seems secret, certainly I’d never been there before and didn’t know about it. On reaching the woods, which are forestry commission so mostly evergreens, we decided to be rash and walk through them. Every time I’ve been lost on a walk it’s been in forestry commission woods. The tracks and paths change constantly and never match the map. I’ve always lived to tell the tale though. This time the track led fairly safely out to where I expected then back along the road to Eskdale Green. Mostly fairly easy going but you need to do a lot of navigating on the outward stretch. It would have been nice, in June, to be able to take a few layers of clothes off but that was not to be.